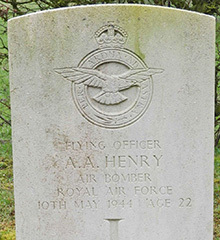 Flying Officer (Air Bomber) Andrew Alexander Henry was born on 22nd April 1922 to Robert James Henry and Elizabeth Ewing Henry (nee Tennant), of Montober, Cookstown, Co. Tyrone. 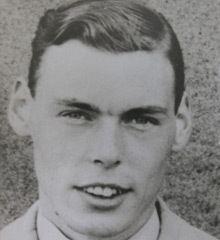 Prior to the Second World War he worked as a Petroleum Officer in the Civil Service, joining the Royal Air Force Volunteer Reserve as a Flying Officer. Alec was flying his 34th sortee when his bomber was shot down over east of the city of Lille in France. Forest-sur-Marque is a village about 9 kilometres east of Lille, a major town in the north of France, and 6 kilometres south of Roubaix. The Communal Cemetery is at the southern end of the village on the main road (N952) to Ascq. From the church in Forest-sur-Marque head south on the D952 and the cemetery will be found 700 metres along on the left. The Commonwealth plot is opposite the main gate in the right hand corner.